Show somebody how much you care with a gourmet chocolate hamper or one of our spectacular Pizza Pyramids. What do you buy for the person who has everything? 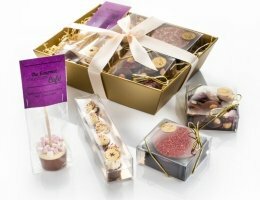 Gourmet hampers are often the go-to choice for many a discerning present buyer as they usually include something for everyone. 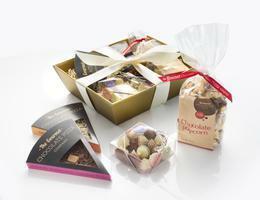 With this in mind we've styled our chocolate gift hampers to take the guesswork out of buying presents. Our Gourmet Chocolate Pizza Hamper combines a number of our bestsellers, including our Heavenly Honeycomb and Salted Caramel pizza slices, along with a box of Chocolate Gems and a bag of chocolate drizzled popcorn - this delicious chocolate gift hamper makes a perfect gift for any chocoholic. 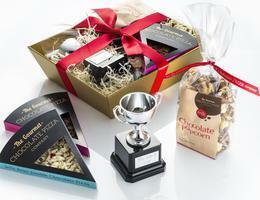 Meanwhile, our Gourmet Chocolate Café Hamper is the ideal gift for any coffee or hot chocolate enthusiasts. 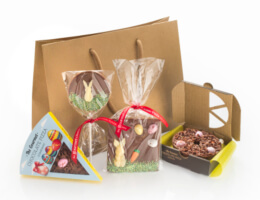 Featuring a Marshamallow Hot Chocolate Stick, a box of Palet Gourmands (think grown-up fruit & nut flavoured buttons), a selection of Mini Chocolate Cupcakes and a small box of our amazing Topitoffs - chocolate discs to 'top' any hot drink or milkshake. 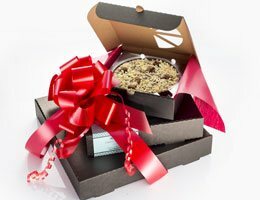 For those of you looking to send a message of thanks to your recipient, our You Are A Star Hamper includes an engraved trophy to keep once the chocolate pizza slices and drizzled popcorn has gone.